Update: CD Projekt Red has further discussed the size and structure of Cyberpunk 2077’s world. Recalling what was said ahead of The Witcher 3, level design coordinator Peter Gelenscer says about Cyberpunk 2077’s world that “it shouldn’t be big, it should be enough.” It’s hard to put an exact number on world size because the city is so much more vertical this time around. “People ask us how big the game world is and it’s a really tricky question. First and foremost it’s very hard to measure because The Witcher was pretty flat, with landscapes and mountains where everything could be observed from the top down. There is a lot going on this week, keep on top of things with our comprehensive E3 2018 guide. Gelenscer was speaking with IGN at its E3 live show. It looks like the team is yet to upload the VOD, but when they do, you’ll find it on their YouTube channel. 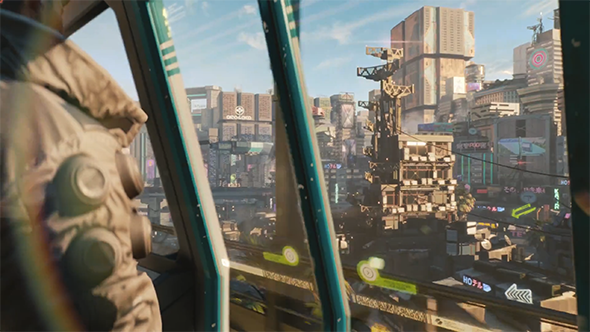 Elsewhere in an interview with GameSpot, associate deisgner Kyle Rowley explained that the game would would be split into six unique disctricts within a single mega city. From the sounds of it, each district will be almost like its own city. There are rich areas, like the Pacifica district, but also ones overrun with gangs. The districts will have their web of quests to explore, stories to discover, and trade networks to exploit. Within at least some of the districts, too, are what are being called megabuildings. These vast structures are so large that they have their own microenvironments inside. It certainly has me thinking of Mega City One from the Judge Dredd comics. Rowley emphasised that the team is pushing verticality with Cyberpunk 2077, so expect to find yourself ascending towering structures and taking routes that will play merry hell with your vertigo. While we don’t yet know theCyberpunk 2077 release date, Rowley also said in the GameSpot interview that the team “will be significantly more open” from now until the game’s launch.